While Leon Gast examined the cult of personality so effectively via Muhammad Ali in “When We Were Kings”, in “Smash His Camera” Gast turns his camera back onto the men behind the lens who help create the persona of celebrities like Ali. 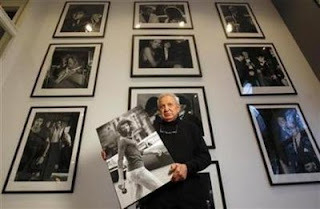 “Smash His Camera” is no less fascinating than “When We Were Kings”, an utterly captivating portrait of the king of all Paparazzi Ron Galella, who famously stalked Jackie Onassis for 30 years and was even more famous for getting punched out by Marlon Brando. For every four letter word he’s had thrown at him Galella has shot hundreds more stunning photographs of the world’s most famous people captured in truthful realism. There are few people who would condone the behaviour of a man like Galella, who plies his trade like a bottom feeding stalker jumping out at his subjects from any possible covert vantage point. Yet when Gaella and Gast show us the results of his work we can’t help but marvel at his artistic creations. And when you hear the war stories from Galella‘s mouth as well as his domestic life with his devoted wife of over 20 years, our perception of Galella as the devil incarnate changes. Through interviews with admirers and denouncers Gast captures this contradiction with a light and humourous tone for maximum entertainment value. Early on one of the interviewees, a fellow photographic artist, remarks that photography is an art form that anyone can do competently, but its the most difficult medium to master - a skill which doesn‘t require dexterity but an innate ability to capture truth on film with just one‘s eye. Gaella has that knack, but unfortunately it took 35 years of abuse and vilification to get respect for his work. Gaella is from the old school of photographers, when they shot on real film, in black and white, and without the relentless competition today from anyone with a point and shoot digital camera. Because of Galella’s gung ho style and refusal to take no for an answer Galella became the best of his business. As a subject Gaella is a fascinating personality, a New Jersey working class professional with an affable self aware and self-deprecating quality. In fact, one of his most famous photos wasn’t taken by him but features Galella photographing Marlon Brando from behind wearing a football helmet. Gast gets Galella to recount his encounters with Brando, Robert Redford, Liz Taylor and others. But it’s his 30 year subject of choice, Jackie O who gets in depth analysis. When asked about why he chose Ms. Onassis as his favourite subject he can only answer that perhaps he was in love with her. The constant chase between the two indeed when described and documented by Gast feels like a long rocky marriage. Its too bad we don’t get reactions from Jackie O herself or the celebrities he harassed all these years. Though perhaps its for the best, for that would be a different documentary, and arguably a lesser one. ‘Smash His Camera‘ works so well because due to Galella‘s affable sense of humour and quirky obsessions Gast manages to get us to love this man who has caused such frustration and nuisance to the people he encounters on a daily basis.